The Sinn sport cap features a stripe of color sandwiched in the bill. 100% washed cotton twill feels relaxed, broken-in from the start. It sits close on the head for a more contemporary look. Includes an adjustable strap in back. Adjustable brim looks and feels custom-made thanks to a memory board. It molds into the desired shape, and stays that way. The cap is in black with a khaki trim. 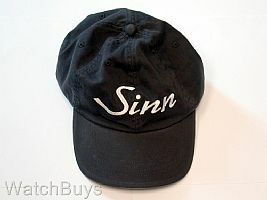 Sinn logo is embroidered in white. This hat is made by Land's End.